For all its fantastic equipment and mystical ninja shenanigans, the GI Joe comic was much more realistic than the cartoon. Even if you you ignore the fact that they use bullets instead of color-coded lasers, just look at the origins of Cobra: in the cartoon, Cobra was founded by prehistoric Himalayan snake-men; in the comics, it was just an angry, charismatic man. The rise of Cobra began with one man. Bitter about a lifetime of failures, resentful of those who wielded power, he began a systematic revenge against the world that he believed had wronged him. He started as a small-time salesman, traveling from town to town, holding meetings in which he recruited people as disillusioned with their lives as he was with his own. His face masked by a hood, he spoke with sibilant persuasion of his twisted vision for a new global empire. A few dozen people joined him, then several dozen more. And then, his dazzling lies mesmerized the entire town of Springfield, which became the birthplace of the evil Cobra organization. This is the seventh Cobra Commander Hasbro has released in 2008, but he definitely breaks new ground - we've never had a Cobra Commander like this before! Heck, if you want to get technical, this isn't even Cobra Commander at all: at this point, still trying to build his nascent organization, he's more like Cobra Recruiter or Cobra Promoter; can't be a Commander with nothing to command, right? Cobra Commander is wearing civilian clothes, rather than his usual military uniform or body armor. It's a nice look, a black double-breasted suit with a single gold pin on the left lapel. It's actually fairly respectable - he takes off the hood, he'd look right at home in any boardroom or even walking down the street incognito. His tie is red with navy blue stripes, and his shirt is white. There are two versions of this figure: the standard is wearing a black suit, while the limited variant was described as wearing blue. You'd think the so-called "blue suit variant" would have been all-blue, to match his hood, right? Not so much - the jacket is done in blue, but rather than matching pants, he's got khakis. So his torso is blue, and his legs are yellow? Bleh. According to the promo copy, he's wearing his "Springfield Country Club" blazer, which explains the big coat of arms on the left breast, and the fact that he's wearing different trousers, but given the choice, I'd prefer the black suit over the blue. As mentioned, this CC's wearing his hood, but it's a new mold - not reused from the single-carded TFAC figure. The cloth hangs straight down, and his nose visibly pokes the cloth outward. I don't know why he felt the need to wear a mask to spread the word of Cobra (other than he knew what he was doing would one day be illegal, and wanted to be able to disappear when the government shut him down), but the look suits him. Cobra Commander uses an entirely new body, though it wasn't intended for him. It was actually created for Indiana Jones' Toht, a figure that wasn't due to be released until 2009, but was eventually cancelled when the line proved a failure. Cobra Commander is so evil, he's stolen a Nazi's body from six months in the (non-existent) future! Wonder how many scientists he had to kidnap to make that happen? He stands 4" tall, and has plenty of articulation: balljointed ankles, knees, elbows, shoulders and neck, plus swivel hips, waist and wrists. That's enough to let him fit in with all your other current Joe figures. The figure has one three-piece accessory, and it's perfect for him: a podium from which to preach at the masses. The stand is 2½" tall, and more detailed than you'd expect. They really could have gotten away with a flat, featureless item, but Hasbro went beyond. The base is layered, the pillar is ridged and there's even a lip on the surface to keep the speaker's papers from sliding away. Detailed! 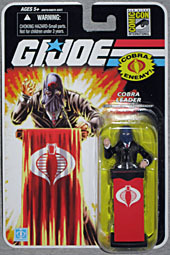 A red Cobra banner (made from paper for this toy) hangs from the front, and both the microphone and the mic stand are separate pieces. This is one hell of an accessory, and Cobra Commander looks great behind it! This semi-civilian Cobra Commander fits our definition of a perfect summer convention exclusive: new version of an existing character, different enough from the standard toys to be worth buying but not so different that your collection will be incomplete without it. If you're a fan of GI Joe and can get this figure at a reasonable price, you definitely should. He doesn't re-use any body parts, and is a cool addition to Cobra's ranks.